Ideal for use in confined areas where the head needs to be flush or below the surface. Fixing component, industrial and construction fasteners. 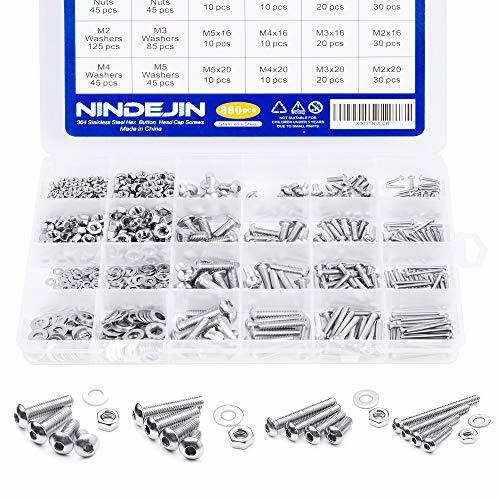 ✌Broad Application:M2 M3 M4 M5 Hex Button Head Screws Washers and Nuts Assortment Kit Serves a wide range of use and for professionals, amateurs, landlords, repairmen, other DIY . The set is perfect to replace broken and missing screws. When you are mad for the missing bolts, it is a perfect friend for you.The kit has lots of different sizes, which can meet the maximum of requirement for you. ✌Standard Metric: Our M2 M3 M4 M5 screws and nuts accord with standardized metric system. And the average error is less than 0.01mm. The Nuts and flat washers expand the contact area and reduce the pressure in order to protect the screws and parts.Compact and force uniform screw thread is not easy to out of shape and slid in the process of rolling and installation. ✌Long-term Storage: All of Screws and Nuts are packed in a durable and sturdy Box to efficiently bear the weight of the whole package. In order to avoid the screws being scattered or lost during use, we specially package for each different type of screws for your convenience and storage. ✌ What you get:880Pcs M2 M3 M4 M5 screws, nuts washers and wrench .Whenever you need us , please contact us by email or Q&A, we will give you a Professional Service and reply you within 24 hours. If you have any questions about this product by NINDEJIN, contact us by completing and submitting the form below. If you are looking for a specif part number, please include it with your message.